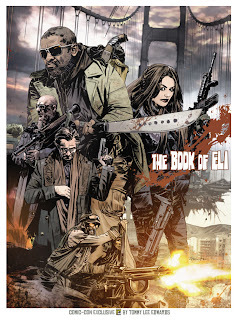 The Billionty-Oneth Geek: The Book of Eli!!! The summer blockbuster season might be a bust, if Shrek 4 is any indication of things to come. So it's a perfect time to look at movies from the recent past. The movie takes place in a post-apocalyptic world, after a global war that saw all forms of art, literature and antiquities destroyed. It follows a man named Eli (Denzel Washington) who is carrying a mysterious book across America. He fends off all sorts of miscreants before landing in a town controlled by a power hungry man named Carnegie (Gary Oldman). It turns out that Carnegie has been searching for that very book as he believes it can be used as a source of power and control over people. He knows that there is only one copy left in the world and when he discovers that it is in Eli's possession, he sends his cronies after him to retrieve it. So the book in question is none other than the good ol' Bible, but for some reason they never refer it to that, opting to call it "the book" in conversations, even though it's quite clear what it is. It's not until the last act when they finally call it the Bible. I thought the movie had a lot of plot problems. At nearly two hours in length, there was a lack of a ramp up throughout the movie, so before the movie can even head to a climax, it just ends. I can't even say that it was anti-climatic because of the lack of a build up. In its final closing moments, I kept thinking that this couldn't be it, there had to be more. But alas it was the true ending. From a technical point of view, the movie was beautifully shot with its rugged landscapes brushed with a low palette. Some of the shots were so visually stunning, it was too bad that they had nothing to complement them with. The fight scenes in the movie were also pretty well done. They were really short and quick fights shrouded in shadows, which sort of reminded me of the fights in Batman Begins. The big gun fight in the third act was also good, done in almost two completely seamless shots... but you can sort of tell how they cheated. So the movie was really mediocre, a case of style over substance. But I'll say this much, even though we only get to see him for a few seconds Monk Denzel Washington is many buys! Later geeks!